Each essential oil used in aromatherapy is said to have different properties. For example, some calm and make you feel relaxed while others energize. Since aromatherapy massage techniques are often the same as those used in Swedish massage (the most common type of massage in the US), people often get it for sore back, neck, and/or shoulder muscles or to ease stress. Aromatherapy massage appears to reduce the pain and discomfort of menstrual cramps, a 2015 study from the Journal of Obstetrics and Gynaecology suggests. Participants did a self-massage with rose essential oil, an unscented almond oil, or no oil on the first day of menstruation for two menstrual cycles. By the second cycle, aromatherapy massage reduced the severity of pain compared to massage therapy with almond oil or no oil. Massage with aromatherapy may also ease menopausal symptoms. In a study published in Menopause, researchers compared 30-minute aromatherapy massage (twice a week for four weeks) to massage with plain oil or no treatment and found that both massage and aromatherapy massage were effective in reducing menopausal symptoms (with aromatherapy massage being more effective than massage only). Other research suggests that aromatherapy massage may not relieve symptoms in people with cancer. For a report published in the Cochrane Database of Systematic Reviews in 2016, for instance, researchers analyzed previously published studies and concluded that "this review demonstrated no differences in effects of massage on depression, mood disturbance, psychological distress, nausea, fatigue, physical symptom distress, or quality of life when compared with no massage." 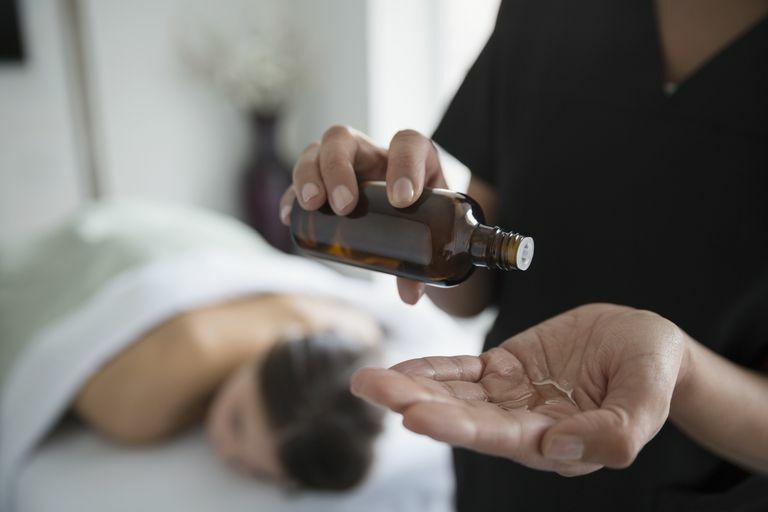 When comparing aromatherapy massage with no massage, they found that "there was some indication of benefit in the aromatherapy-massage group but this benefit is unlikely to translate into clinical benefit." Although you can find aromatherapy massage at almost every massage clinic or spa, the style of treatment, degree of customization, and the quality of essential oils varies widely. Many massage therapists have one or more premixed blends and will select the blend based on your health concerns. A massage for relaxation and stress relief would likely include lavender essential oil, while an uplifting massage may include rosemary essential oil. Your therapist may involve you in the selection process by asking you to smell various blends. Some massage therapists may add essential oils to massage oil immediately before each massage based on your unique condition or health goals. The quality of the essential oils varies widely. Essential oils are different from oils made with synthetic scents which don't have therapeutic effects. Massage therapists who are highly knowledgeable about aromatherapy tend to use quality essential oils in their massage oils. Once the massage oil is selected, the therapist leaves the room so you can disrobe and lie on the massage table. You will usually be asked to lie face down under a sheet. When the massage therapist begins the massage, you may notice the subtle aroma of essential oils. After the massage, the massage therapist may suggest a blend that you can use at home in between massage treatments. Avoid eating a meal right before a massage. If it's your first time at the clinic or spa, arrive early so you can complete the necessary forms. Otherwise, you may want to give yourself some time to rest and relax before starting the massage. A licensed massage therapist should take your health history before the massage. Essential oils may cause an allergic skin reaction. Essential oils are highly potent and can be absorbed through the skin, so it's important to avoid excessive use of aromatherapy oils and to only use oils that have been properly diluted by a carrier oil. If you're sensitive to scents, aromatherapy may not be right for you. If you are pregnant or breastfeeding, check with your doctor to see if this type of massage is safe for you. If it is, your doctor may also be able to recommend a licensed massage therapist who is certified in pregnancy massage. Massage shouldn't be done directly over bruises, skin rashes, inflamed or weak skin, unhealed wounds, tumors, abdominal hernia, or fractures. If a massage is painful, tell your massage therapist immediately. If you have a health condition, you should consult your doctor before getting an aromatherapy massage. People with certain conditions, such as cancer, may need to avoid essential oils and/or massage at certain times during their treatment or avoid it altogether. Aromatherapy with essential oil-scented massage oils and lotions may help to ease stress and anxiety. If you're considering trying aromatherapy massage, it's a good idea to talk with your healthcare provider first to discuss whether it's appropriate for you. Darsareh F, Taavoni S, Joolaee S, Haghani H. Effect of aromatherapy massage on menopausal symptoms: a randomized placebo-controlled clinical trial. Menopause. 2012 Sep;19(9):995-9. Sadeghi Aval Shahr H, Saadat M, Kheirkhah M, Saadat E. The effect of self-aromatherapy massage of the abdomen on the primary dysmenorrhoea. J Obstet Gynaecol. 2015 May;35(4):382-5. Shin ES, Seo KH, Lee SH, et al. Massage with or without aromatherapy for symptom relief in people with cancer. Cochrane Database Syst Rev. 2016 Jun 3;(6):CD009873.